What are the uses of Google Notebook? What does it do? ">What are the uses of Google Notebook? What does it do? To get started you need a Google account. This is very simple and shouldn't take more than five minutes. You then must download the Google Notebook application. Then later when you find text on the internet that you would like to save, highlight it, right click and select notebook this in the drop down menu. Also, if you search on Google and you think a result seems interesting but don't have the time nor inclination to look at it then, there is a button below the search result that says note this, click that button and it will be saved into your Google notebooks. Who uses Google Notebook? ">Who uses Google Notebook? Google Notebook can be used in many different ways. Teachers can use the organizing and clipping functions to help their in classroom duties, using the organizing tool can help keep class subjects and lesson plans organized and packed with information. Those in business and industry can use Google Notebook for keeping their staff or partners informed about any type of research or projects by sharing notebooks. Sharing notebooks helps by allowing everyone you choose to see a notebook, edit it and send it back. The title of this application is Google Notebook, it is a free program developed by Google. Google Notebook was released on March 15th, 2006. At that time Eric E. Schmidt was the CEO of Google, Sergey Brin was the Technology President and Larry Page was the Products President. As of 2010 Google Notebook is no longer open to new users. Those who already have a Google notebook account can still access their information and use the tools but they are being encouraged to switch to other Google programs such as Google Docs. The first link goes to the Google Docs login page to get started. It is free of charge and a great alternative to Google Notebook. The second link goes to the Firefox extension of Google Notebook, which still works. And the final link leads to a website that provides 8 links to great alternatives to Google Notebook. An alternative also to consider is Google Notebook for Android phones through an app for Google Applications. This allows you to view what you have saved in Google Notebook but does not allow you to add anything. Google Notebook allows users to "note" different web pages on the Internet. If you come across something on the web that you find interesting, want to investigate later, think would be useful for a project, etc. you can notebook it. It helps you put everything into an online "notebook" consisting of text clippings, entire pages, pictures, and anything else you might want to include. If you would like others to view your notebook you can make it public, and in this way you can also view others notebooks. Thus if you and a friend are both doing a project that requires extensive research online, you can view one another's notebook giving you the ability to see what research they've done and determine what pages you think are valuable for the project. The basic function of Google Notebook is being able to clip anything from the web into your notebook, so you can easily access it. Once the extension has been downloaded, all that is left to do is highlight the text you want, right click, and select the option Note This (Google Notebook)." Once this is done your notebook will pop up in your bottom right hand screen showing the text that was entered. Then the user has the option to name the notebook, create a new notebook, and add different sections or comments into the notebook. The youtube video below gives a step by step tutorial for Google Notebook. It is very easy to organize material with Google Notebook. For example, if a student is taking notes for several different classes, he or she can set up a notebook for each class and keep all of the subjects organized. It is possible to organize each notebook further by adding section headings for each note; each section can be named according to its content or by the date that the notes or information is recorded. This makes it useful for college students especially because when taking notes in class, it is possible to date each section according to when the notes were taken. Google Notebook makes it simple to clip important information that is found when surfing the internet. After the Google toolbar is installed, all that is necessary to do is highlight the particular information that is desired, right click, and choose 'Note This' and Google Notebook will save it in a notebook. In addition, it is always possible to go back into the Google Notebook account and organize the saved information via any computer with internet access. Saving and organizing important information has never been easier. 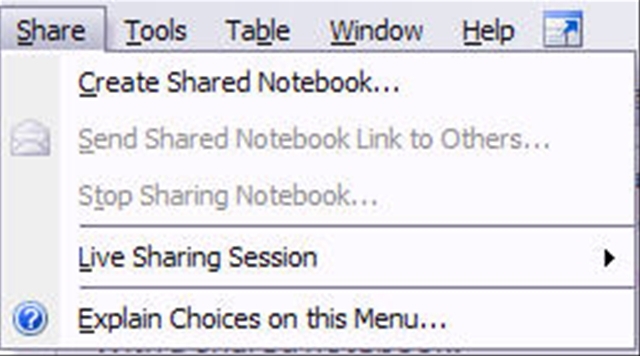 Once a notebook has been created, it can be made private, shared with people from a list of email addresses or made public simply by clicking Share at the bottom left of the screen, or by clicking sharing opitions at the top right of the screen when the notebook that is to be shared is open. Once Share has been selected, the program shows a screen that gives the option to add email addresses or to make a notebook public. Sharing notebooks is very simple and quick, and allows any job to be done quickly and efficiently. 1. This is an example of one of my Google Notebooks that I am going to export into Google Docs. To do this you just click the Export button, which is at the bottom of the page. 3. By clicking Export, it will populate this screen and you are ready to start typing your paper into Google Docs. Overview: Students will see how beautiful butterflies can really be by painting a butterfly in which they’ve researched and studied during the “Butterfly Life Cycle Unit”. Objective: Students can understand how different butterflies come in different shapes and colors. After researching different types of butterflies, students will choose a butterfly that they found particularly interesting and then will paint a watercolor picture of it. Objective: How to choose a healthy array of fruits and veggies every day? Pick several bright colors! Fix them in tasty new ways, too. Students will learn the differences between the book and the movie of The Fellowship of the Ring. Overview: Students will learn to research their topic, construct a Google Notebook to organize their findings, and write a research paper. • Finally, students will present their research and show how they have used Google Notebook to keep their research organized. Overview: Students will learn to research and compile a group presentation over a current issue of their choice. Objective: Students will utilize Google notebook and create a shared notebook where they can all collect research including sources and notes. They will also use either Google notebook or another application to create an outline for their presentation. And lastly they will present their information as a group to the class. Groups will consist of 4-6 students. Overview: Students will research a current scientific issue in the biology world and present it to their classmates with a group. 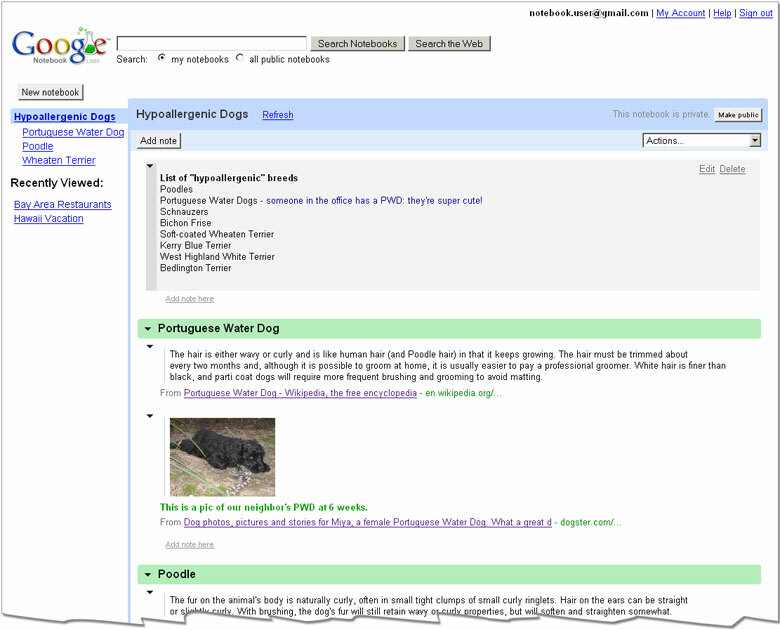 Google Notebooks can be a free and useful tool for any company. For instance, if any company deals with research, the ones who are doing the research can place their information in the notebooks and share with their departments or supervisors easily. If needed they can publish their work and distribute their research via the web. The employees can also use Google Notebooks as a tool, using it to access work information on their home computer, allowing them to take their work home if needed. Google Notebook is also beneficial for traveling. If a company sends someone to London for a presentation, then he can access his notes through Google Notebook the same way he could if he were home. Google Notebook's ease of use and mobility make it a great asset for companies to use. Google Notebook can be a useful tool for international use. Google Notebook's accessibility allows people from all over the world to see other peoples ideas in a matter of seconds. For example, if someone goes on vacation they can access everything they have saved in Google Notebook from any computer that has internet access. Google Notebook has the ease of access for people all over the world to view information that they couldn't normally see unless they were on their home computer. Google Notebook is a tool that is very helpful for teachers and students alike. Teachers are already using this program to create, organize and save lesson plans. One teacher explains in an online blog that Google Notebook makes it simple for him to organize class discussions and he is also impressed that he is able to save a link on one computer and view it later from another computer. After reading this teacher's blog, other teachers from different areas commented on how they also use Google Notebook. One teacher said that almost every teacher from her school now uses the program to organize lesson plans. Google Notebook can be very useful in an elementary school setting. Assisting the teacher in organizing lesson plans that may involve multiple web components, and helping them to organize material based on semester, week, or subject. Google Notebook also allows a teacher to select only the parts of a websites that he or she would like to use for their students, giving them quick access to the information they want without having to filter through the other information on the site. They can also save favorite websites or instructions in one place and reach them from any computer later on. The teacher can even share her notebook with the students using a computer lab, or even their home computers. In secondary education, Google Notebooks can help the teachers and the students. For example, the teachers can use the notebooks to create their lesson plans, saving sites and information easily on Google Notebooks. They can collect information and publish it on a website making it viewable for all of their students. Google Notebooks is a trouble-free way of having the opportunity to access your information quickly, students can get into their notebooks on any computer without the need for a flash drive. Also, for students who like to take notes on a computer, Google Notebooks is perfect, the section headings and labels make notes easy to read and navigate through. The notebooks also work well for group projects, giving students the ability to share the notebooks with each other via the internet and Google Notebooks. Google Notebooks is a way for college students to be able to organize their assignments quickly and efficiently. Allowing you to take notes on Google Notebooks and be able to go back through and organize them before a test or quiz. you can label them and quickly access them if needed on any computer with an internet connection. If you have a research project due, you can search the web and any relevant information you find you can highlight the and add to your notebook. In addition, if you are working in a group you can either publish or share your notebooks making them visible to all of your group members. Google Notebook: Quickly Clip interesting Passages to Save and Share. (2007, August 18). Retrieved November 10, 2008 from the World Wide Web:http://teacherhax.blogspot.com/2007/08/google-notebook-quicklyclip.html. 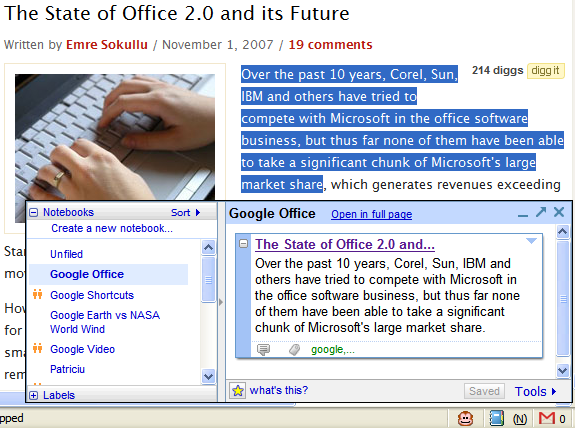 Office OneNote 2007 Product Overview. (2008). Retrieved November 14, 2008 from the World Wide Web: http://office.microsoft.com/en-us/onenote/.Willingham. Zoho Notebook. (2007). Retrieved November 14, 2008 from the World Wide Web:http://www.notebook.zoho.com (2008). I hope everyone is ready to get this project off the ground and get started. Our group was assigned to do Google Notebook, so if you don't have it, all you have to do is have a google account, go to the homepage and download the Google Notebook browser extension, so we can all start researching what it is about and hopefully get it down to a science. If you have any questions you can e-mail me at cthofer@purdue.edu and I pretty much check my e-mail a million times a day so feel free to ask anything whenever. Let's get this project rolling. Cameron and myself are going to be your Team Leaders for this project and I hope to have nothing but success. I have already began playing around with the Google Notebook and I think that there is a lot we can do with it to make this an amazing project. I hope everyone makes an account (like Cameron suggested) and starts goofing around with this program to learn all the ins and outs of it immediately. The quicker we get started on this, the easier it will be in the end. Feel free to e-mail me at any time at agoldsmi@purdue.edu and i will get back as soon as possible. I will also try to keep everyone updated on this site so check it often.